At AccuShred, we have seen the explosion of data breaches here in Ohio, the Midwest, and around the country. By most accounts, businesses are simply not prepared for the aftermath of a data breach. As a trusted provider of data destruction services, we want to help small and medium-sized business owners by providing access to a comprehensive data breach protection solution. AccuShred has partnered with the Certified Information Privacy Professionals at CSR Privacy Solutions to provide a full suite of industry-leading data protection services for our customers. Is your organization prepared to handle a data breach? The level of complexity that companies face when responding to a data breach is one of the main reasons we vetted this powerful program called CSR Readiness® Pro. The CSR Readiness® Pro suite contains the CSR Readiness® Pro Risk Assessment and award-winning patented Breach Reporting Service™. Combined, these solutions can help reduce the risk of a data breach. There were 12,449 data breaches in 2018. That’s a 424% increase from 2017, and if early 2019 is any indication, the trend will continue. CSR Readiness® Program is the PROACTIVE solution for your business to improve the way it handles personal information and will help you identify and assess your potential privacy or security weak points. Once identified, prioritized remediation tasks are recommended to help your organization amend, adjust, and improve your organization’s overall privacy practices. This is a critical step should your company ever face an investigation or legal inquiry related to a breach. CSR’s patented Breach Reporting Service (BRS), provided by Certified Information Privacy Professionals, is the REACTIVE solution that will assist with your legal requirements to report a breach. In the event of a breach, CSR takes the worry and hassle out of reporting the loss or breach of personal information to an ever-expanding number of authorities. The privacy professionals at CSR have the expertise and will handle the mandated federal and state notifications and take care of notifying your customers. The CSR Breach Reporting Service™ can also help mitigate fines and protect your reputation. 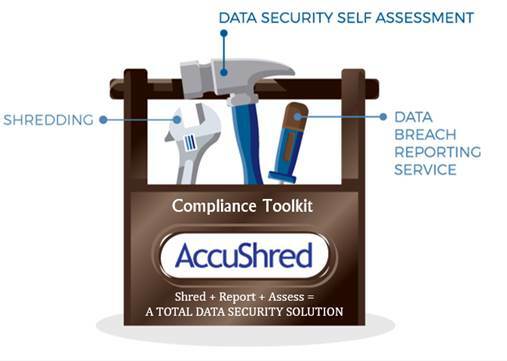 AccuShred is more than just a shredding company, we are your full-service provider for data security solutions. Helping our customers securely protect the Personally Identifiable Information (PII) they handle is our number one goal and utilizing this powerful service will help avoid a data breach that could potentially devastate your business. We are offering the CSR Readiness® Pro Suite that combines both the CSR Readiness® Program and the CSR Breach Reporting Service™ for only $39.95 a month.